On the first day of the Hannover Messe, April 23, Klaus Helmrich welcomed you to the annual Siemens Press Conference. As member of the Managing Board of Siemens AG, Klaus Helmrich is responsible for the Digital Factory as well as Process Industries and Drives Divisions. The Press Conference took place at 6:30 PM in the Trade Fair's Convention Center, Room 1 A/B. Mr Helmrich talked about the latest developments of digitalization in the manufacturing and process industries under the theme "Digital Enterprise – Implement now!". Presentation Klaus Helmrich: Digital Enterprise – Implement now! Siemens Energy Management will hold a press briefing on the subject of "Innovative and future-proof energy distribution" on April 24. The event will begin at 9:00 a.m. at the Radisson Blu Hotel (near the exhibition grounds) with a presentation by Günter Kachelriess, R&D Medium-Voltage Technology and Dirk Helbig, CTO High Voltage Products. After that, Cedrik Neike, member of the Managing Board of Siemens AG, and Beatrix Natter, CEO Power Transformers at Siemens, will present a new concept for the digitalization of transformers. This launch will take place at the Siemens booth, which we will be glad to give you a tour of afterwards. Future-proof energy distribution means safe, digital and environmentally friendly energy distribution. Siemens Energy Management will present the new Blue GIS portfolio and a new concept for digital transformers at the press briefing. Presentation: Power supply is going "blue"
Background: The power supply system is going "blue." Innovative technology for enhanced sustainability. On Monday, February 26th, the traditional press conference prior to Hannover Messe took place. Insights into the company's planned business and technological orientation were provided by Dr. Jan Mrosik, CEO of the Digital Factory Division; Ralf Christian, CEO of Energy Management Division and Dr. Jürgen Brandes, CEO of the Process Industries and Drives Division. In addition, these executives highlighted the latest product innovations being unveiled at this year's Hannover Messe. 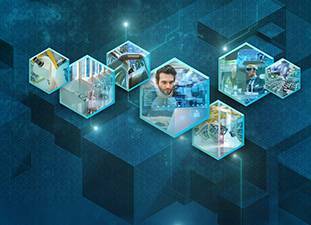 Booth slogan: "Digital Enterprise – Implement now"
At the Hannover Messe 2018, Siemens will be showcasing a comprehensive series of examples which demonstrate how users can harness the potential of Industrie 4.0 by implementing Digital Enterprise solutions. The focus of the 3,500-square meter booth in Hall 9 is on industry-specific implementation of Digital Enterprise solutions over the whole life cycle. Examples from aerospace, automotive, food and beverage, electronics and machine building as well as the chemical, fiber and oil and gas industries illustrate how companies of any size and from any industry can increase their competitiveness with individual digital solutions – through greater flexibility, efficiency and quality as well as shorter times to market.